Belt Conveyors: Star Trace Pvt. Ltd. The conveyor belt can be categorized as basic belt, snake sandwich belt and long belt. According to kinds of drive, it can be divided into mechanical conveyor belt and electric conveyor belt. According to materials, it can be classified as rubber conveyor belt, nylon conveyor belt, polyester conveyor belt, EP conveyor belt, etc. 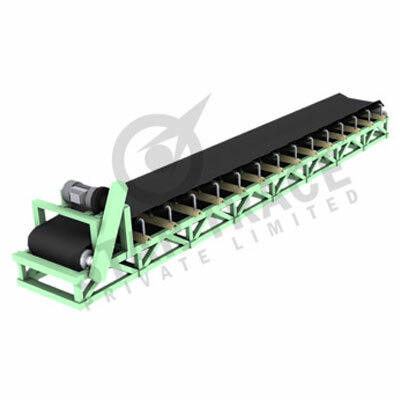 Our conveyor belt is a transmission component of the mining crushing machine. It can be used as e-waste recycling plant, mining conveyor belt and coal conveyor belt. According to kinds of drive, our conveyor belt can be divided into mechanical conveyor belt and electric conveyor belt. The former use planet-cycloid reducer and vee belt to convey goods. The latter is driven by motorized pulleys. The conveyor belt can be used independently, or used together with other conveying equipment. Its working temperature is in the range of -20 to 40. The temperature of delivered materials should be below 50. It features high transportation volume, simple structure, reliable performance and easy maintenance. Our conveyor belt is extensively used to convey bulk materials or end products in e-waste recycling plant, mining, metallurgy, and coal industries.